This week I’ve been in a minor funk. Nothing big, just teetering on the edge of funk-town lately. It boils down to this – I want to move out and feel like I’m doing something with my life. Instead, I’m living at home, which is great, but not at all what I want to do right now. I’ve always been the type of person who needs to feel like life is going somewhere in order to have a sense of accomplishment. What can I say, I like progress! But since my life hasn’t progressed in this particular way, I’ve been kinda bummed. And for better or worse, in times of despair, I turn to food. So yesterday I decided to make some comfort foods to cheer me up…and what’s more comforting than potatoes? Let me first say that it seems weird to write out all the ingredients in this post’s title haha. Holy crap it’s long! But I couldn’t think of a shorter way to introduce this recipe, so there ya go. 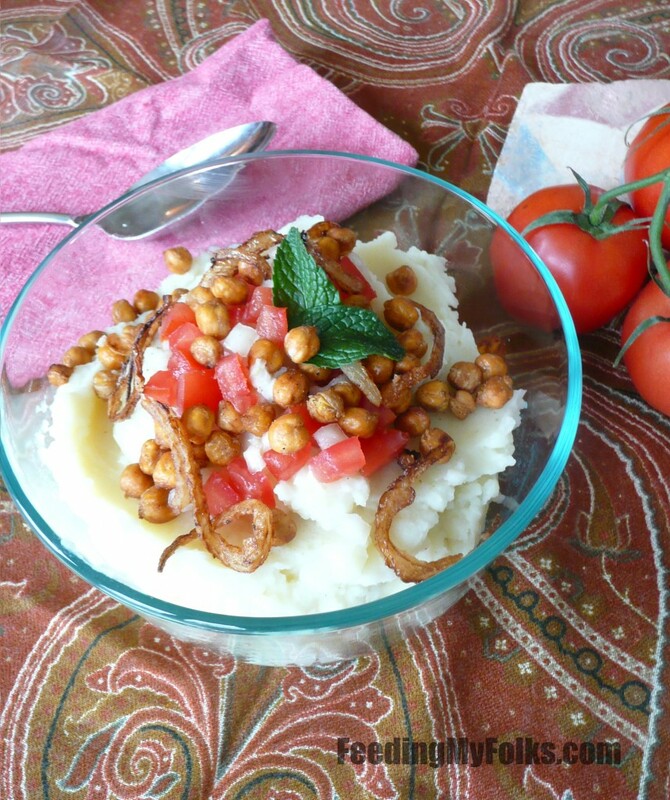 It’s a creamy bowl of potatoes topped with crispy chickpeas, fried shallots, chopped tomatoes, and fresh mint. Oh, and some yogurt mixed into the potatoes gives them a delicious creamy tang. 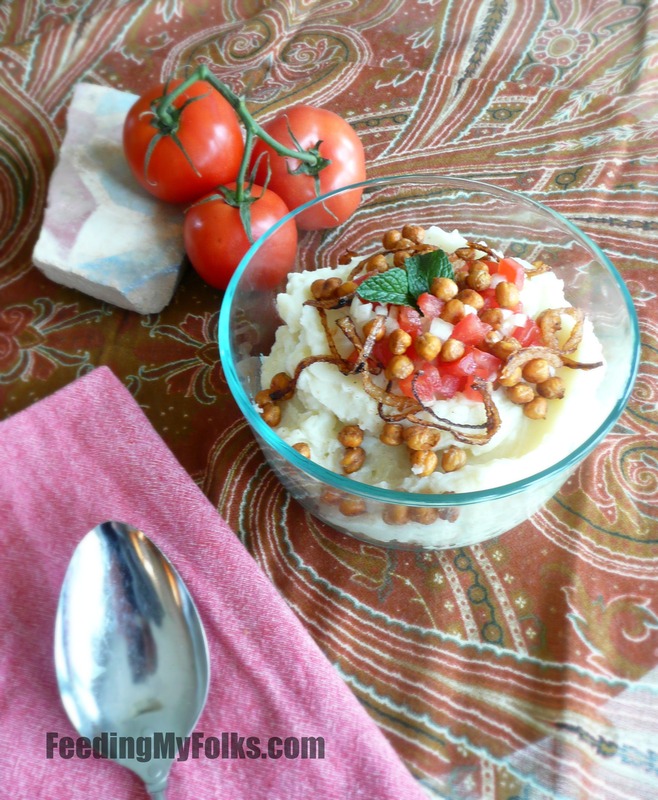 It’s a fun, fresh flavored spin on your classic mashed ‘taters. Don’t worry about it tasting minty. I know that doesn’t make sense without trying it, but the mint (combined with the tomatoes) just awakens the rest of the dish…kind of similar to how a hint of lemon often makes food taste fresher. It’s good! I’m behind schedule with everything I wanted to do today, so I’ll leave it at that. Happy Wednesday everyone! Cook the chickpeas until crispy. Directions found here. Combine the diced tomato and onion. In a small saucepan over medium heat, add the oil. When oil is hot, add in sliced shallots. Fry for about 2 minutes, or until lightly brown and crispy. Meanwhile, add the bayleaf and a pinch of salt into a large pot of boiling water. Carefully add potatoes and boil until fork tender, about 10 minutes. Drain, remove bay leaf, and return potatoes to the hot saucepan. Stir in milk, garlic, yogurt, and butter. Add salt/pepper. Mash to your desired consistency. Stir in chopped mint. 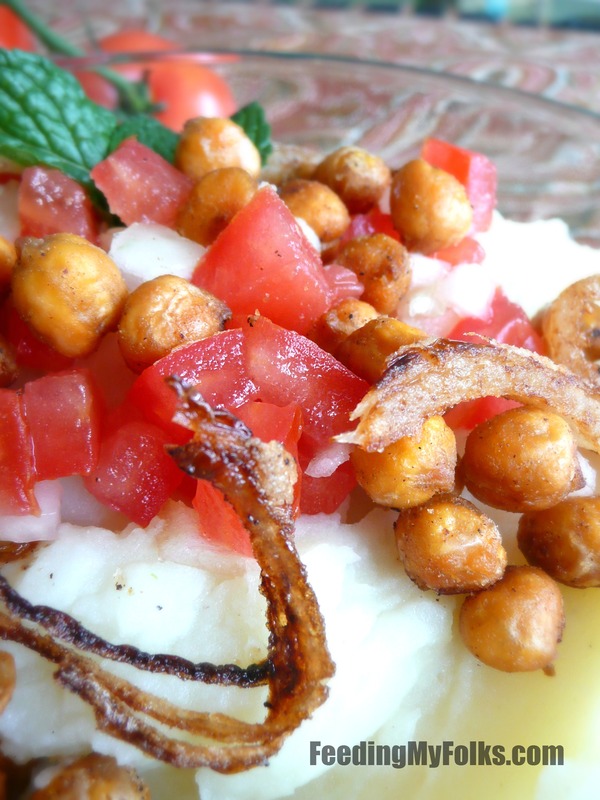 Serve by putting potatoes into a bowl, then top with chickpeas, tomato/onion, fried shallots, and an extra leaf of mint. Incredible. I know what you mean about the funk….it has been a long winter.